Nerd-fession time. I am not a huge anime fan. I don’t know what it is, but it’s never really turned my crank. I mean, I’ve enjoyed animes (mostly classics, like Akira, Vampire Hunter D, and Ninja Scroll), but I’ve never been a devoted fan. It’s something about the storytelling style. Or maybe it’s the animation. I honestly can’t say. That said, I’ve always had a curious interest in games inspired by anime. Exalted, my favorite tabletop RPG, owes a lot to anime style (bigass swords, battle auras, attack with cool names, among others), and I quite enjoyed the simple, stylish system of the dearly departed Big Eyes, Small Mouth. So my curiosity at the recently released Tenra Bansho Zero comes as little surprise to me. Let me tell you about this little gem of a game. Obviously, this madcap ‘everything and the kitchen sink’ piece of work was originally written in Japanese. The English translator (and licensee) is Andy Kitkowski, for whom TBZ has been a ten year labor of love. It shows. I’ve read games translated from faaaaar less distant languages than Japanese that didn’t come across nearly so well. He’s paid a lot of attention to the details, and it shows. The world through Kitkowski’s lens is evocative and stylish, and I can’t imagine that much is lost in translation. I haven’t made any judgments about the system, but it looks pretty simple. I have a fondness for systems that use one die type, and this one does. Basically, you roll a boatload of d6’s and accumulate successes ala the Storyteller System or Shadowrun. Eventually, I’ll stat up a character and see how that comes together. Oh, and I forgot to mention–the book is MASSIVE. I bought the PDF on drivethrurpg, and was treated to a total of 700 pages between the world book and and rule book (as well as text-only versions of the same for quick reference). And all that for a measly $14 bucks. That’s value, in my opinion. If TBZ lacks in any department, it’s in the art. Now, don’t get me wrong, this is probably my anime/manga bias talking, because there is a ton of spectacular, full color art between the two volumes. But it all kind of runs together, stylistically speaking. In most games with art of this quality, I find myself scrutinizing each picture, absorbing the nuance and looking for inspiration, but in this case, I found myself suffering art fatigue. Given the spate of no art/low art games that have come out lately, this is very much a first world problem. Still, I feel like Fantasy Flight Games’ RPG title “Anima: Beyond Fantasy” has art very much in this vein but with a bit more character (incidentally, it is also a translated game, developed in Spain, but unlike Tenra, it has a nearly incomprehensible system). Incidentally, I hadn’t realized until after making my digital purchase, that the print edition of Tenra was actually the product of a very successful Kickstarter (like 1300% successful). As someone who was blissfully unaware of the title until last weekend, I have to say that all those lucky backers got one helluva product. I love these success stories, and how they stand in contrast to the projects that don’t deliver as successfully. I have more reading to do, as I feel like I’ve barely scratched the surface of this mammoth game. 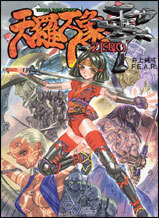 In the meantime, if you didn’t back the project, give yourself a treat and pick up a copy of Tenra Bansho Zero. There is enough madcap, Japan-to-the-max craziness in there to soften the most anime-ambivalent heart–I should know. Chris, What beautiful art and colors! Thanks for sharing.